The Puerto Rican boxing commission has suspended former world champion Juan Manuel 'Juanma' Lopez and trainer Albert Rivera for their post-fight brawl which took place this past Saturday night after Juanma had knocked out Rivera's fighter, former champion Wilfredo 'Papito' Vazquez Jr.
Boxing Scene confirmed that Juan Cartagena, who is the executive director of the Boxing Commission of Puerto Rico, announced "Both are suspended until we review the case." 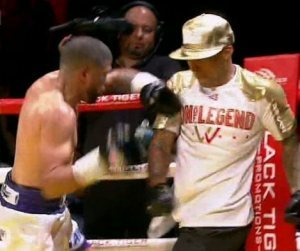 The incident took place after the stoppage was called by the referee in the eleventh round at the Coliseo Roberto Clemente in San Juan. When the fight was over, Rivera stepped inside the ring and Juanma came over to confront him. As that happened the trainer clocked him with a left hook and a full brawl broke out between the two of them. Their respective teams jumped in to separate them as a very heated crowd began to pelt the ring with bottles and ice. Juanma eventually took the microphone and called for calm, pleading with the audience to remember that there were a lot of children present - including his own - in the arena. This is not the first time that Juanma has been sanctioned by the local commission over an incident which took place immediately after a fight. In April 2012, Lopez was suspended for one year, fined $10,000 and ordered to complete 100 hours of community work by the local commission after branding referee Roberto Ramirez as a degenerate gambler in a post-fight interview, which took place after Juanma's TKO defeat to Orlando Salido on March 10 of that year. Juanma was trying to allege that Ramirez stopped the fight at a certain point as part of a wager he placed on the fight. The boxer would later apologize to the official, who filed a lawsuit for damages later on.